John & Emma Smith Jr.
John Philip Smith Jr. married Emma Louise Boulé on June 18, 1917 in New Bedford, Massachusetts. They were both 27 years old. 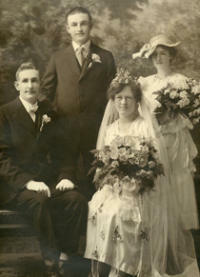 The best man was John Jr.'s brother Edward and the Maid-of-Honor was Emma's cousin Hilda Fournier. They purchased their house in 19?? 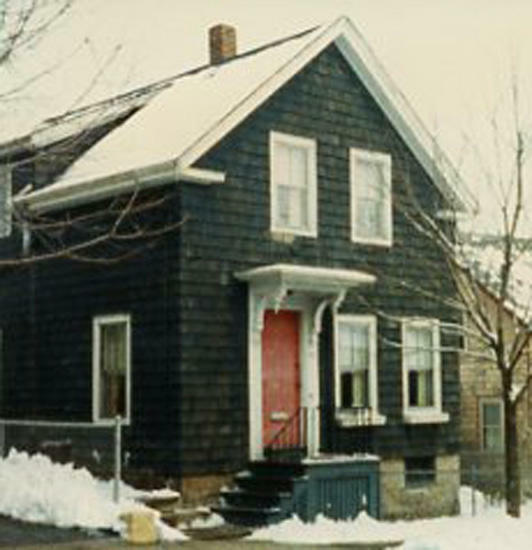 at Weld Street 1987, New Bedford. In 19?? they also purchased a summer cottage at Sassaquin Pond, New Bedford. They had 5 daughters and 11 grandchildren. Born in New Bedford on July 29, 1890. He died on August 19, 1958 in St. Luke's Hospital in New Bedford after a 5-week illness (per newspaper article). He was the first son, second child, of Anastasia and John Philip Smith Sr. He had 1 brother and 3 sisters. John was a New Bedford police officer for 36 years and was the oldest ranking officer in years and service in the department. In 1940 he rescued an 11 year old boy from drowning (view article). She had one older sister Mary Matilda (Mayme) Sylvia born June 10, 1887. Paternal Parents - John and Anastasia Smith Sr.
John Philip Smith Sr. was the son of Philip Smith and Mary P. (Murtha). He was born in ?? on February 27, 1862 and died in New Bedford on March 12, 1947. John Sr. (age 23) married Anastasia (age 19) on October 15, 1885 in New Bedford. They had 5 children (3 daughters and 2 sons) and ?? grandchildren. John Sr. was a mill operator (per John Smith Jr. birth certificate). Anastasia was the daughter of Edward Brennan and Anne. She was born in Bray, County Wicklow, Ireland on December 9, 1860, emigrated to Boston June 18, 1883 (age 23) and died in Fall River, MA on May 30, 1935. Honore was the son of Francois Boule and Matilda (Savoie). He was born on February 1, 1858 in Henryville, Province of Quebec, Canada and died in New Bedford on September 29, 1935. Honore and Margaret met and married in Dedham, Massachusetts. They were both 28 years old when they wed on May 26, 1886 and were married for 48 years. They had 2 daughters, Mary and Emma, and 6 grandchildren. Margaret Whiston was the daughter of James Whiston and Mary (Dunne). She was born in Bray, County Wicklow, Ireland on December 9, 1860. 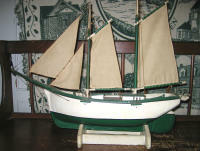 Margaret emigrated to Boston June 18, 1883 (age 22) aboard the S/S Helvetia National Line. She became a US citizen on October 8, 1904 (age 44). She died suddenly in Fall River, MA on May 30, 1935 at the age of 74. Her husband Honore died 4 months later.